Although electric can openers are now readily available, some users still prefer the traditional models. They may be considered old-school tools, but manual can openers have proven their durability and strength for many years. One of the trusted models currently out is the Swing-A-Way 6090 Easy Crank Can Opener. This tool is intended for users who are looking for long-lasting quality. It is designed to handle opening more than just a few cans per week. Compared to electric can openers, this tool can be used anytime, anywhere because it does not require any battery. Let's see if this is a tool that you would want to have in your kitchen. 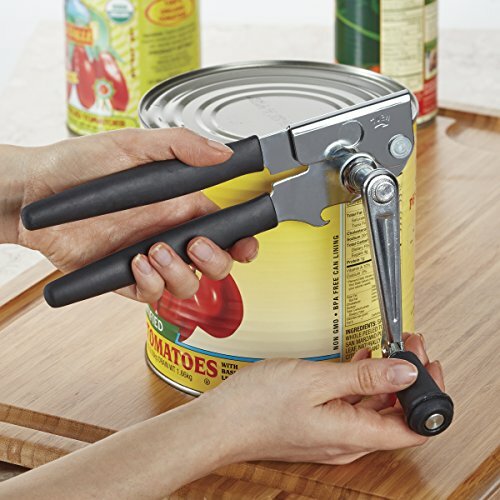 When you purchase the Swing-A-Way 6090 Easy Crank Can Opener, you get to enjoy a 0.5-pound manual can opener that is relatively more affordable than its counterparts. Although it has a traditional construction and design, it does come with several qualities that are worth the money. The Swing-A-Way 6090 Easy Crank Can Opener boasts an all-steel, solid construction. The blade is sharp that, with just a simple push, you are able to start cutting the lid without any hassle. It feels sturdy and powerful too, which means you exert less effort. The high-carbon cutting wheel is very sharp and rotates smoothly along the lid. With this performance, it does not skip any part and ensures even cutting. As this tool does not leave any sharp edge, it is safe and prevents cuts and accident. These mechanisms work together to make the tool efficient and safe. Generally, manual can openers are quick and easy to use. Sometimes, though, they require a little bit of practice to achieve efficiency. Using the Swing-A-Way 6090 is straightforward and convenient and does not need much effort. A feature that makes it easy to use is its comfortable handle. This is a long crank handle that improves the user’s grip. This handle is cushioned too, so it is fun to hold. As a result, it puts little tension in the hands while you operate it. The Swing-A-Way 6090 is versatile. It can open various sizes of cans including one-gallon or number 10 cans. This tool also comes with a built-in bottle opener, so you get more from your money. You also save storage space for having a can opener and a bottle opener in one tool. What is also good about this tool is that it is easy to wash. It is dishwasher-safe and should be washed with mild detergent. However, to ensure no food debris is stuck in its mechanisms, hand washing is recommended. Rinse and dry immediately to maintain its quality and prevent rust. The Swing-A-Way 6090 is a very simple manual can opener. Despite its simplicity, it has notable features and qualities that should not be underestimated. It has a hard-wearing, solid construction that can last for many years. Although it does not come with features like a lid magnet or lever, it compensates with a built-in bottle opener. More importantly, it is more reasonably-priced that any other products under the same category. 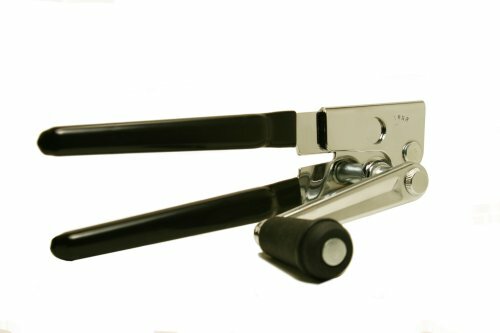 Compared to other manual can openers, the Swing-A-Way 6090 is comfortable and easy to operate. Its long, cushioned handle provides a comfortable grip, and the blade is sharp enough that it opens the lid smoothly and without skipping any portion. This is a great tool for users who have hand pain and want an efficient, long-lasting can opener. The Swing-A-Way 6090 Easy Crank Can Opener seems like an excellent, heavy-duty tool. However, some users may want to look at other options—perhaps, something that is more affordable. One good product to consider is the Zyliss 20362 Lock ‘N Lift Can Opener. This can opener features a stainless steel cutting blade that creates a smooth spin. With this mechanism and a sharp blade, it opens the can in a few seconds. Similar to the Swing-A-Way can opener, the Zyliss 20362 Lock ‘N Lift has a comfortable grip that prevents hand pain. One of the unique features of the Zyliss Can Opener is its magnetic attachment. With this attachment, taking the cut lid is convenient. This portion lifts the lid off after it is cut and a lever releases the lid off the magnet for easy disposal. Moreover, this device comes with a five-year guarantee. It is very affordable and worth the price. Despite these features though, the Swing-A-Way 6090 Easy Crank Can Opener is still considered the better choice. Why? The Zyliss can opener is difficult to punch into the lid. Sometimes, it even fails to cut the lid continuously. The Swing-A-Way 6090 functions just the way it should be. It is not an extravagant tool that requires special usage instruction. It is reliable, convenient, and does not break the bank. It is worth an investment for any household kitchen. Manual can openers are still the best choice when it comes to reliability and durability. There are hundreds of them in the market, but some have questionable quality. The Swing-A-Way 6090 Easy Crank Can Opener is one of the exceptions. Since it is manually operated, it does not rely on any electrical parts that need any battery or power source. The only drawback of the Swing-A-Way 6090 Easy Crank Can Opener is the lack of magnetic portion. This means that you have to take the cut lid off the can using a knife or your finger, which poses risks of cuts. With the thorough evaluation of the Swing-A-Way 6090 Easy Crank Can Opener, it can be concluded that it is the best manual can opener because it is sturdy and comfortable to use. It is a worthy investment and a tool that can't be easily replaced by an electrical can opener. Although it is a simple device, you can expect that the Swing-A-Way 6090 Easy Crank Can Opener is powerful, safe to use, and convenient. Some recommended products may use affiliate links. KitchenFinders.com is a participant in the Amazon Services LLC Associates Program, an affiliate advertising program designed to provide a means for sites to earn advertising fees by advertising and linking to Amazon.com. Amazon and the Amazon logo are trademarks of Amazon.com, Inc or its affiliates. Copyright © 2018 Kitchen Finders | All Rights Reserved.